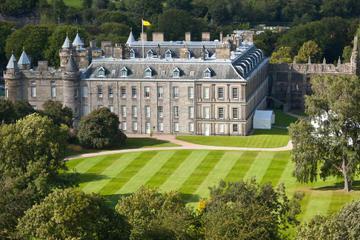 Edinburgh is a charming, Georgian city that is abuzz with activities all year round, from the Hogmanay street party to the Edinburgh Festival in late summer. 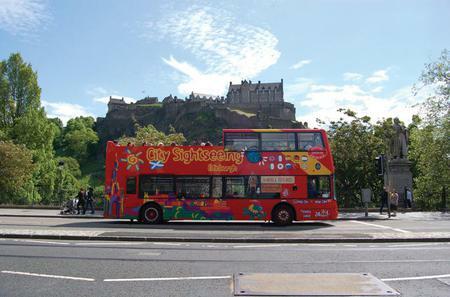 Book a hop-on hop-off tour to see the many delights the city has to offer, along the historic Royal Mile and further down. 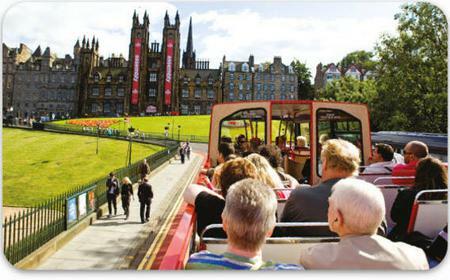 Hop-on hop-off buses run daily all year round, and start from Waverley Bridge which is to the west of the train station. 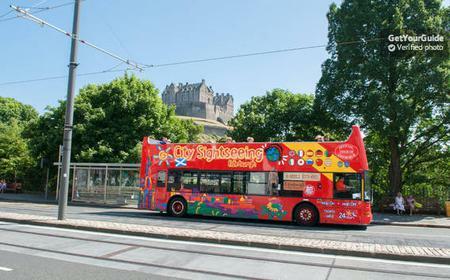 City Sightseeing buses stop at ●Lothian Road for St John’s Church, ●Grassmarket in the Old Town, ●Lauriston Place, ●Johnston Terrace, ●Lawnmarket – the oldest part of Old Town with some of the best preserved closes and courtyards, ●Chambers Street for the National Museum of Scotland, ●John Knox House, ●Our Dynamic Earth, ●Holyrood for the Palace of Holyroodhouse and Scottish Parliament, and ●Canongate Kirk on the Royal Mile. Buses run every 20 minutes from 9.30 am till 8 pm in summer, and around sunset otherwise. 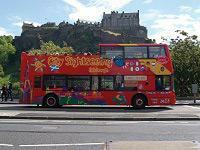 Edinburgh Tour buses stop at ●George Street, ●Charlotte Square – a UNESCO World Heritage Site in the New Town with historic buildings and private gardens, ●The Mound, ●Lawnmarket, ●Grassmarket, ●Our Dynamic Earth, ●Scottish Parliament, and ●Canongate Kirk. Buses have live on-board guides. Tours run every 15 minutes from 9.35 am to 5.50 pm in summer, and every 20 – 30 minutes from 9.40 am to 3.40 pm from November to March. 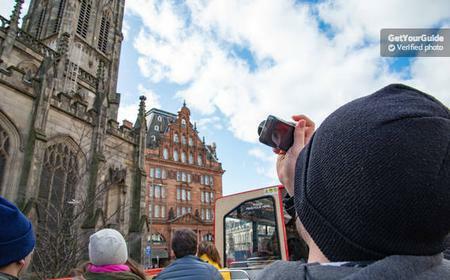 MacTours buses stop at ●Princes Street, ●Lothian Road, ●Johnston Terrace, ●Lawnmarket, ●Chambers Street, ●Waterloo Place, ●Queen Mary's Bath House, ●Our Dynamic Earth, ●Queensberry House, and ●Canongate Kirk. Buses run only from March to September every 15 – 20 minutes from 9.35 am to 5 pm. 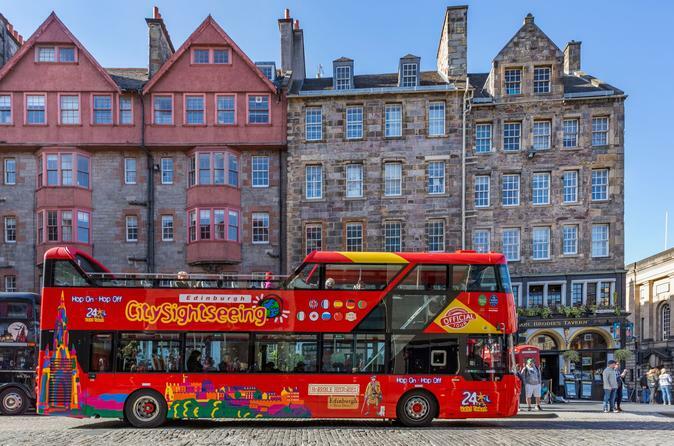 Majestic Tour buses stop at ●George Street, ●Royal Botanic Garden, ●Ferry Road, ●Newhaven Harbour, ●Cruise Terminal, ●Ocean Terminal, ●Leith Mills, ●Elm Row, ●Queen Mary's Bath House where the eponymous queen bathed in white wine, ●Queensberry House, and ●Canongate Kirk. Buses depart every 30 minutes from 9.45 am to 4.45 pm.